12/10/2017 - A high level team from the Global Forum on Transparency and Exchange of Information for Tax Purposes visited Quito on 10 and 11th October, to launch the induction programme for Ecuador, which became a member of the Global Forum in May 2017. The team comprising Ms. Monica Bhatia, Head of the Secretariat and Ms. Ana Rodriguez-Calderon, Tax Policy Analyst, accompanied by representatives of the Inter-American Development Bank, held bilateral meetings with María Fernanda Espinosa, Minister of Foreign Affairs and Human Mobility, José Leonardo Orlando Arteaga, General Director of the Internal Revenue Service, Mauro Alejandro Andino Alarcón, Director of National Customs Service, and Christian Mauricio Cruz Rodríguez, Banking Superintendent during the two days. Minister María Fernanda Espinosa, reaffirmed the importance Ecuador places on the fight against tax evasion and avoidance in raising revenues and ending poverty. 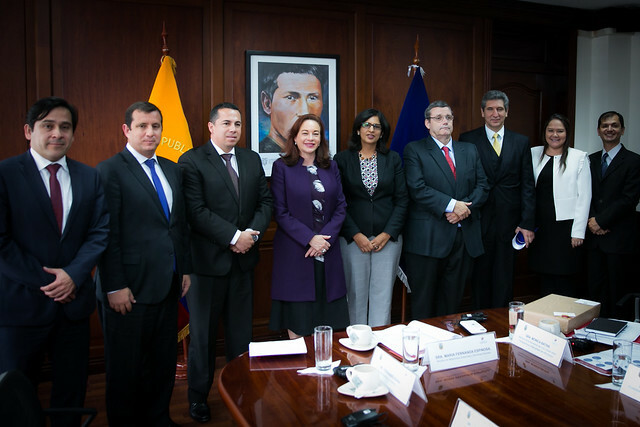 She welcomed the induction programme and conveyed the country’s resolve to take the appropriate steps to ensure that international tax cooperation is a priority in Ecuador. Ms Bhatia assured Ecuador of the support of the Global Forum in implementing the international standards of tax transparency and in benefitting from the more transparent global tax environment. During the visit a technical workshop attended by more than 20 participants was organised with Ecuador’s Internal Revenue Service and other stakeholders including representatives from the Ministry of Foreign Affairs and Human Mobility, Ministry of Economy and Finances, Unit of Financial and Economic Analysis, Superintendence of Companies, Securities and Insurance, Banking Superintendence, Secretary of Intelligence and National Customs Service. Apart from creating awareness of with the international standards, the workshop focussed on Ecuador’s benefits in implementing the tax transparency standards and the need to anticipate the peer review scheduled to be launched in 2020. At the end of the workshop discussions were held on a roadmap for Ecuador to implement the standard of exchange of information on request and automatic exchange of information. The Global Forum has similar induction programmes ongoing with 20 other member countries.